A young piano virtuoso and “supremely gifted” opera singer will have starring roles at the launch concert for an international music festival. Sion Edwards, 17, and Welsh National Opera (WNO) mezzo soprano Rebecca Afonwy-Jones are set to enchant the audience at St Asaph Cathedral on Wednesday, June 20, at 7.30pm. The concert will be the curtain-raiser for the acclaimed North Wales International Music Festival that will be staged at the same venue from Saturday, September 15, to Sunday, September 30. The launch event comes only weeks after Rebecca wowed audiences with a stellar performance in Madam Butterfly on the other side of the world in Hawke’s Bay, New Zealand. Tickets are on sale and a large turnout is expected to mark the official release of the exciting programme for this year’s main festival in the autumn. It is the 46th year of the spectacle founded in 1972 by composer William Mathias, now a highlight of the UK classical music calendar. Rebecca and Sion have past links with the festival and are delighted to be performing at the launch. The glittering evening will also see celebratory choral performances from Ruthin’s Cor Cytan Clwyd and Corwen-based male voice choir Cor Meibion Bro Glyndwr, harp ensemble Telynau Clwyd and a quartet from the festival’s resident orchestra, New Sinfonia. All will give a hint of what is to come at this year’s main festival where Rebecca will again be performing in an extra emotional appearance as her husband, fellow opera star Julian Close, will be on stage too. Julian is a WNO regular and following the North Wales festival he will make his debut in Montreal, before a return to The Metropolitan Opera, New York. Rebecca, meanwhile, though only in her thirties, has also become an established presence in the operatic arena, having performed worldwide and been heralded by critics as ‘one to watch’. In February she starred in a sell-out production of Madam Butterfly in Napier, Hawke’s Bay, New Zealand. She was cast by the kiwi nation’s Festival Opera to reprise her role of the servant Suzuki, which she previously performed to critical acclaim for WNO. Having studied at Guildhall School of Music and Drama and Royal Conservatoire of Scotland, she became a WNO associate artist in 2013 as part of a scheme to identify young British singers and develop their talent at the start of their career. She has secured roles in La Traviata, Nabucco, Sweeney Todd and Cavalleria Rusticana, among other operatic masterpieces, and has performed in Norway, Oman, Italy and Ireland. The Mid-Wales farmer’s daughter has a special place in her heart for the North Wales International Music Festival after she and three other Welsh National Opera singers, Katy Thomson, Huw Llewelyn and Dyfed Wyn Evans were soloists for the triumphant Welsh premiere of Magnifcats by Paul Mealor and Oliver Tarney at last year’s event. She said: “Since I live in Montgomeryshire this wonderful festival, is relatively speaking, on my doorstep, so I shall be delighted to return once more in 2018, after my first experience with the Magnificat project that was such a resounding success in September 2017. Rebecca believes life on a Welsh farm gave her the tenacity to pursue her career in music. Festival Artistic Director Ann Atkinson, herself a mezzo soprano, who has sung with Glyndebourne and Scottish Opera, is thrilled to be welcoming Rebecca back. She said: “She’s supremely gifted. The audience were riveted when she performed in our Magnifcat Journey concert. So to have her as a soloist at our festival launch concert is a real coup. 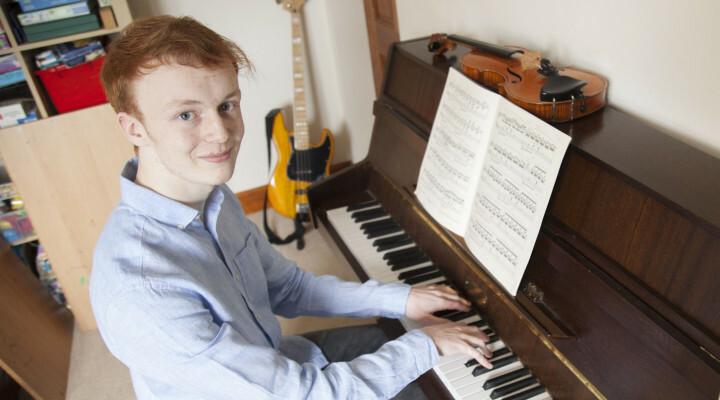 Sion, from Pwllglas, near Ruthin, is the nephew of top violinist Iona Davies, of Llangollen, and will be appearing at the launch concert hot on the heels of sitting his A-level exams. He has been learning piano since he was aged five and violin since he was nine. He practices for two hours each day and attends Royal Northern College of Music tutorials every Saturday. The last few weeks have been busier than ever for him, sitting A-level in music, physics, maths and history at Ysgol Brynhyfryd in Ruthin. He comes from a musical family and enjoys performing piano recitals with his two younger sisters, Cerys, 15 and Cathrin, 11. He is inspired by his aunt Iona Davies, of Llangollen, a violinist in London who plays with orchestras around the world and performs regularly with The English Baroque Soloists, The Orchestra of the Age of Enlightenment and The Academy of Ancient Music. Sion said: “I’d love to have a career like hers. But it’s important to obtain my academic degree first so I’m taking it a step at a time. Sion has impressed audiences at past festival masterclasses including with English classical pianist Peter Donohoe and Japanese virtuoso Noriko Ogawa who he describes as ‘fantastic mentors’. He also credits his music teacher, Teleri Sian, with encouraging his talent. The fan of baroque music hopes to deliver works by Bach, Chopin, Debussy and Gershwin on the big night. He will also be joining in some of the choral performances. Tickets for the launch concert are £10 and are available from caroline@nwimf.com or Cathedral Frames, 28 High Street, St Asaph – 01745 582929. To find out more about the North Wales International Music Festival please visit www.nwimf.com.